The London based Republican support group, the Wolfe Tone Society, held its second annual fundraising dinner dance on Saturday 2 April with Sinn Féin TD Martin Ferris travelling to the GAA Club in Ruislip, London as guest of honour for the event. Speaking to supporters, amongst whom was Labour MP Jeremy Corbyn, Martin Ferris said that the latest attempts at the criminalisation of republicans by the British and Irish Governments and their allies in the media would not succeed, adding that he believed the recent propaganda onslaught was motivated by fear of the continuing success of Sinn Fein, particularly in the 26 Counties. For years, he said, Ireland had been governed by an elite, who inhabited "a golden circle of privilege" and who had perpetrated and perpetuated inequality and injustice. This same elite, he continued, now saw this power and privilege being threatened by the success of Sinn Féin. In a bid to shore up their positions, they had reacted by putting the already fragile Peace Process in further jeopardy by supporting the unreasonable demands of the DUP and participating in the campaign to blame Sinn Féin for the failure of the negotiations. He outlined the lengths to which Sinn Féin had gone to try and secure a peace deal before Christmas last year, but added that it had become very clear during the negotiations that, whatever the party offered, "there was never any hope whatsoever of the DUP sharing power with Sinn Féin". Nevertheless, Sinn Féin remained committed to pursuing its political goals of a just and peaceful settlement. Martin Ferris also reiterated Sinn Féin's call to the killers of Robert McCartney to come forward and answer for their actions. However, he added, whilst the McCartney family deserved every sympathy, it was not right to create a hierarchy of victims and the McCartney family should be aware of the attempts to politicise their loss and use it as a stick with which to beat Sinn Féin. He added that as far as he was concerned, those who carried out the murder were not entitled to call themselves republicans, because true republicans pursue justice for all and until those responsible were held to account for Robert McCartney's death, there could be no justice. Denis Grace, convenor of the Wolfe Tone Society, looked back at the group's activities over the last year which included organising and raising funds for the visit of a group Belfast children from interface areas to London, travelling to the 26 Counties to help in the election campaign of Sinn Fein candidate Maurice Quinlivan, helping to ensure a platform for Sinn Féin at the European Social Forum, organising the London Bloody Sunday rally, and fundraising for the party. He told the gathering that the Wolfe Tone Society was proud to reiterate its support for Sinn Féin saying that "Republicans from all over have been able to see through the recent onslaught for what it is — an attempt to demonise Sinn Féin and prevent further growth and support for them". "The attempt to criminalise republicans is nothing new," he continued. 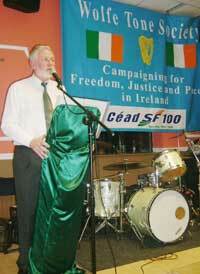 "They tried to criminalise Wolfe Tone and failed; they tried to criminalise James Connolly and those of 1916 and failed; they tried to criminalise Terence MacSwiney and failed; they tried to criminalise the Hunger Strikers and they failed; they tried to criminalise Mairéad Farrell and again they failed; they tried to criminalise Joe Cahill and once more they failed. "They failed because you cannot criminalise a movement that has produced the likes of these people — or one that continues to produce the likes of Martin Ferris."